Sixty-three ESPN experts (a term that should be taken lightly in some cases) shared their picks for Super Bowl XLVI, which kicks off tomorrow in Indianapolis. So what's a nerd to do with all this data when he needs a break from his dissertation? Why, over-analyze it of course! The findings support my suspicion about the media at large: the consensus pick is Giants over Patriots in a close one. Contrary to Vegas (which still has the Patriots -3 at the moment), the average pick is Giants 25.4 vs. Patriots 24.5--not too far off from the Madden NFL '12 simulation. I hope both teams have been practicing their one-tenth-of-a-point conversions. The chart above ignores Gregg Easterbrook's oddball pick (Giants over Patriots 2-0 following a safety in overtime) but I included it in the calculations. Giants pickers are also more confident than Pats backers, predicting a 5.1 point margin of victory versus 4.2, respectively. Most expect this game to be a close one. 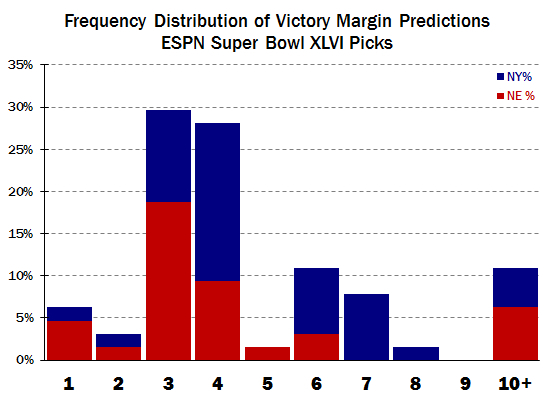 Only seven of the sixty-three pickers expect a double-digit margin of victory, four of whom picked the Pats. The mean margin of victory is 4.7, the median spread 4 and the mode spread 3. The O/U for the ESPN population is 49.9. What's that? You say I have yet to over-analyze to your liking? Yeah, that's what I thought you said. Well, then... Even though 55.6% of the ESPN crowd picks the Giants to win, the Pythagorean expectation is less optimistic about a Giants victory. 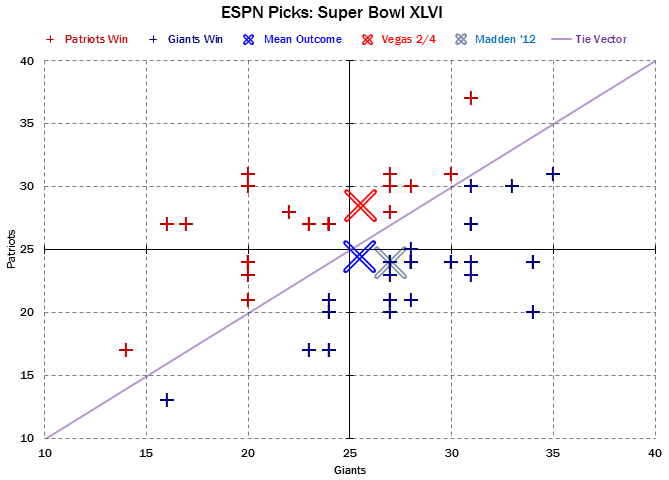 Using a Pythagorean exponent of 2.67 (best fit for the NFL over the past decade) the consensus scores for the Giants and Patriots imply a 52.5% chance of victory for Big Blue, or 53% if you use Jim Glass' unit Pythagorean method (which is really only appropriate for a cluster of unique games or simulations, but what the heck). My pick? Well, as a Giants fan betrothed to a Patriots fan, my pick is for peace in the household. I'd advise you to take the under.